Shortly after arriving in Chaco Canyon last month, we hiked up to the Una Vida Great House near the visitor’s center. Una Vida is in a near-natural state of preservation with no major vandalism, and with only minor excavations and preservation repairs. Time and the forces of nature have collapsed the roofs. Walls have fallen. Centuries of blowing sand have covered the rooms with a protective blanket of sand. 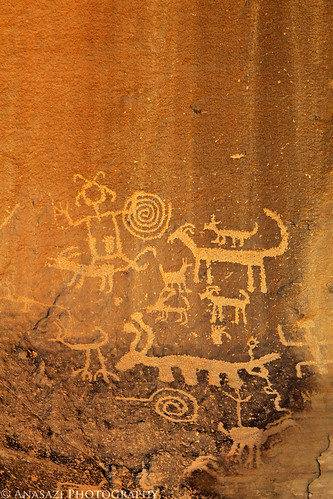 A short walk up the slope behind Una Vida will take you to a few petroglyph panels. This is one of the better panels that we found in the park. I actually ended up returning to the panel later in the evening so that I could photograph this site bathed in the warmer late evening sunlight.